IIoT’s net result can impact quality control, predictive maintenance, supply-chain traceability and efficiency, sustainable and green practices, and even customer service. Four words are exuding both enthusiasm and unease throughout the metalforming community. The words? Industrial Internet of Things (IIoT), which is known for its potential to stamp out inefficiencies, eliminate bottlenecks and streamline operations. Hence, the enthusiasm. As for the angst, that stems from bottom-line uncertainty. Simply put: Manufacturers want to know how and when the efficiencies of IIoT will translate into revenue, and what the return on investment (ROI) will look like. Surprisingly, the potential return can be identified and quantified prior to any implementation. Furthermore, implementation can be simplified with the help of a managed service provider, dedicated to IIoT, and possessing the expertise for conducting in-plant evaluations that pinpoint an achievable ROI. Many manufacturers lack understanding of what IIoT is, and how it applies to industry. So, let’s unpack it. IIoT uses sensors to collect previously unavailable data on equipment, parts, inventory and even personnel. Data are shared with existing systems in an interconnected smart system, and executives can analyze reports based on that data. In many cases, the sensors provide critical information required to increase efficiency and streamline operations. IIoT systems facilitate machine-to-machine intelligence and interaction so that the systems learn to become more efficient based on available data points and traffic patterns. That way, the proverbial left hand knows what the right hand is doing. And the data collected can be used in reports for analysis by executives and operations personnel seeking opportunities to increase operational savings and revenue. While seemingly complicated, IIoT is a logical extension of the ever-increasing automation and connectivity present inside of today’s modern plants. Its net result can impact quality control, predictive maintenance, supply-chain traceability and efficiency, sustainable and green practices, and even customer service. For Pacesetter Steel Services, Inc., a national processor and distributor of flat-rolled steel with processing facilities in Atlanta, Chicago and Houston, IIoT holds great promise. Pacesetter works with Industrial Intelligence, LLC, a managed service provider that offers turnkey IIoT products, to install sensors in each of its facilities. Dashboards allow management to view information in real-time and make decisions leading to increased efficiencies. The move to IIoT already has yielded significant returns for Pacesetter. For a recently completed project, Industrial Intelligence installed sensors designed to track production schedules throughout the plant. The information revealed two bottlenecks: one in which coils were not immediately ready for processing, causing a production slowdown, and another where the skids on which the coils are placed weren’t always ready. 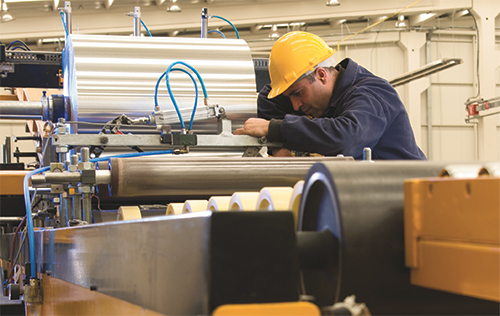 By real-time monitoring the status of both coil and skids, and alerting key personnel when production slowed, Pacesetter was able to push the production schedule through the existing ERP system. This increased productivity at the Atlanta plant by 30 percent. Similar implementations in the other two facilities yielded similar productivity increases. According to Darren Tessitore, COO of Industrial Intelligence, the process for determining possible ROI begins with a factory walk-through with manufacturing-process experts and IIoT engineers who understand the back-end technologies. A detailed analysis then is prepared, outlining the scope of the recommended IIoT implementation, exact areas and opportunities for improvement, and the location of new sensors. Following the analysis, companies such as Industrial Intelligence can provide a solution that covers the entire gamut: specifying and installing hardware and software, station monitors, etc. ; building real-time alerts, reports and analytics; training management on how to use data points to increase profits; and continuously monitoring and improving the system as needed. “Unless you’re a huge company, you really don’t have someone to create a cost-effective solution that enables you to compete with the larger players in the space,” says Leebow Wolmer. Article supplied by Industrial Intelligence, Kenneshaw, GA; tel. 770/462-2940, www.industrialintelligence.net. our words are exuding both enthusiasm and unease throughout the metalforming community. The words? Industrial Internet of Things (IIoT), which is known for its potential to stamp out inefficiencies, eliminate bottlenecks and streamline operations. Everywhere used processor for its own facility. all work depends on the computer and it also depends on a processor. It will great. For more information, you go to that site.